A wonderful friend who knows how much I love both my birthday and pandas, sent me this fantastic gift. How lucky am I to have such a good person in my life? Congrats for your birthday, Pamela. Yes, you are right, you are so lucky to have a good friend! These panda slippers are gorgeous! Kisses!!! Happy half Birthday. Very cute the slippers. Happy half birthday..love the pandas! Catching up on your posts, that festival was amazing, love the costumes, like crowd watching too. Your lunch looked wonderful. Happy half birthday, dear Pamela. Half Birthday, what a great idea! I didn't get to celebrate my real birthday this year, so maybe I'll do this instead. 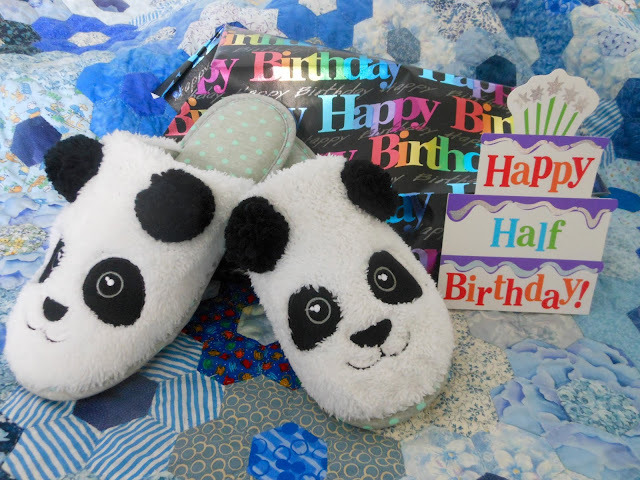 The panda slippers are very cute!